I want to talk about something that comes up a lot with my clients. This is one of the biggest stumbling blocks when it comes to progressing and being able to move forward. It’s also 100% created by ourselves and most people don’t realize they’re creating these road blocks for themselves in their life. We’re talking about perfectionism today. What is perfectionism? Why is it a problem? How do you know if you have it (and I’m guessing more of you have it than you might think)? And what can I do to move forward? Google defines it as: a refusal to accept any standard short of perfection. 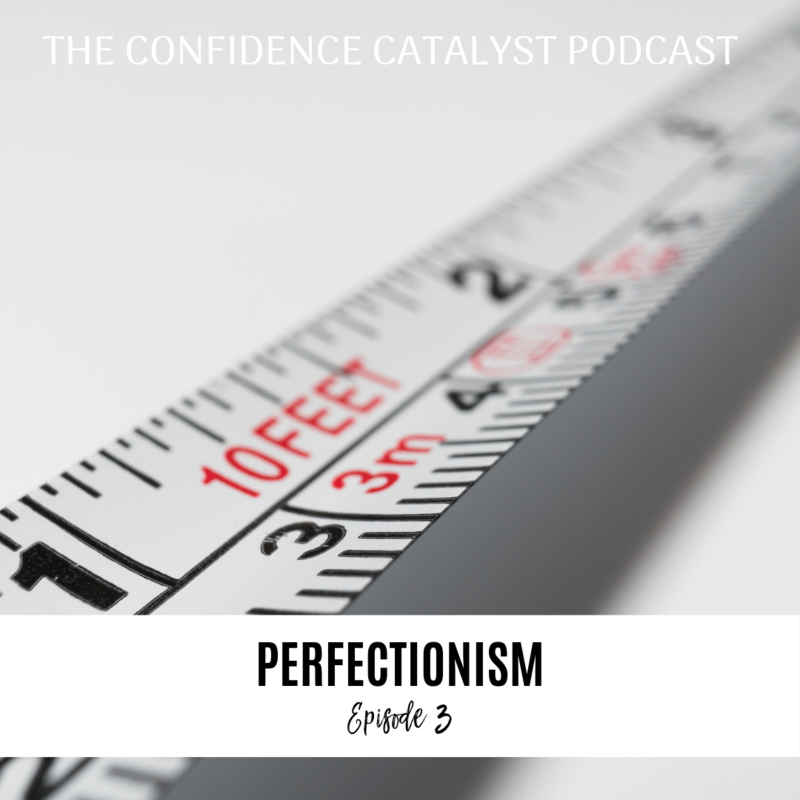 But when we dive deeper into perfectionism and what it really means for us, it’s not so pretty. One of the problems with perfectionism is this idea that something CAN be perfect which is such a subjective word. So in this light perfectionists, even while achieving goals, reaching new heights, hitting major milestones, they’re not happy. They can’t enjoy these moments because, it’s not enough. They’re still not enough and so they block out joy. What’s really fascinating is that a lot of perfectionists don’t see themselves as perfectionists. A lot of people assume that to be a perfectionist you’re living at this high standard of perfection. That their lives seem perfect, their house is perfect, they look all put together all the time, their kids, their family, their everything is perfect. Which is why a lot of perfectionists don’t recognize that they’re perfectionists because they’re not to that standard yet. They’re procrastinators. They wait until the last minute to do or create something and when they do they pick out all the things that could and should have been better. And they think, “gah, I’m such a procrastinator!” But really they’re procrastinating because they’re waiting for the “right” idea to come along, the “right” moment, the “perfect” solution. So they keep putting it off waiting and waiting and never settling on an idea because they still believe that perfect is out there. Then the moment comes when it’s due time and they scramble and put it all together only to beat themselves up later because they waited. If they had prepared better. If they had started earlier. If only, if only. I used to have this habit that I didn’t even realize until my husband pointed it out to me in our early years of marriage. I would give a gift, something I made and immediately, like right after they opened it I’d point out the flaws. Like, they couldn’t even get out a thank you yet before I was there apologizing that it wasn’t perfect and for sure in my mind I was chastising myself for not being a better… or more accomplished, or if only I were more like so in so. I was seeking perfection in a beginner body. I wasn’t an expert seamstress but in my mind I felt like I had to be or it wasn’t good enough. I wasn’t content with the final product. But even here I did not recognize that I was a perfectionist. I wouldn’t have called myself that at all. I knew my flaws far too well to think I was perfect. But that’s the thing with perfectionists. It isn’t that they think their life is perfect. Or that they are perfect. It’s that they believe that anything less than perfection isn’t enough. They’re constantly critical of themselves and consequently others as well because they’re looking for that standard of perfection. They know it’s not them so their brain is focused on, if it’s not here, then where is it. So we see others with what we think we want to have and we start comparing ourselves to them. We compare our looks, our accomplishments, our homes, our roles – ah, she’s such a better mother than I am. Look at how she interacts with her kids. I don’t do that. They compare and then they use that as ammunition to point out and berate themselves for falling short, for not living up to these fictional standards, and for not being enough. It’s this constant pressure and weight that we put on ourselves. This idea that something could and should have been better and what we’re doing, who and what we are isn’t enough, this, we aren’t acceptable. But the thing is, perfect is subjective. There is no such thing as a perfect life. We look at others and think they must have everything, they’re living the perfect life. They have the perfect job, the perfect family, the perfect body, the perfect house. They’re perfect and because I’m not them, I’m unacceptable. I’m not enough. But this thinking IS the perfectionist in us. We have this belief that something could and should be better. No matter what it is, it could have been better. You could have done more, contributed more, had better or more Nobel thoughts about it, shown up better, been better. This belief that there is something better and that you’re not it IS a tale-tell sign that you’re a perfectionist. This isn’t to say that you can’t strive to achieve more. There’s a huge difference between goal oriented people who strive to reach their potential vs the perfectionist that is hyper focused on all their imperfections, mistakes, and all the things wrong in their lives and in themselves. The perfectionist doesn’t allow room for growing or growth – they should already know it. They should already be it. If they make a mistake, it’s not that they made a mistake, in their minds, THEY ARE the mistake. It’s not I did something wrong. To them, it’s Something is wrong with me. Perfectionists have this belief that they could and should be perfect so they strive for achievement to prove to themselves that they’re worthy, that they’re of value, that they have something to offer. In short, they don’t allow themselves the opportunity to be human. There’s no room for error. They should already know it and be it. 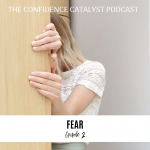 So challenges are frustrating to them because it’s not only that it’s a challenge, that life, their work, their family, their weight, whatever is the current challenge – it’s a challenge for anyone but to them it means something highly negative about them. It’s a character flaw. Perfectionists are often lonely. Even surrounded by many people, family, friends. They feel lonely because there’s no one they can talk to about their trials, struggles, and perceived flaws. They can’t admit to anyone that they’re struggling, this would solidify that they’re not perfect – which means to them, something is inherently wrong with them. I see this a lot with clients in the beginning actually. They start to be vulnerable and make progress and then they seize up. Their brain goes on defense and quickly builds up this wall. They can’t share any flaws because to them it means something about them. They don’t allow themselves to be a mess – even to themselves. They’re so used to telling themselves that they’re unacceptable and telling someone else that they have negative thoughts, that they’re struggling in areas of their lives is dangerous territory because they’re so afraid that they’ll be “found out”. They’re afraid of what others think of them. To them it’s better to keep it hidden. Don’t share. Because it’s not that they’re human and humans are here to learn and grow. They don’t see it like that. They see it as I shouldn’t think that way. I shouldn’t be that way. I should know better. I should be better. I should already know. So they keep trying, keep masking their challenges and struggle through them all while berating, chastising, and being super critical of themselves in the process. Because what’s happening right now, this struggle, this not knowing – is unacceptable. So they continue striving and striving and striving not to become or to grow or to learn. Their motivation is to prove that they’re okay, that they’re worthy. Perfectionists have this belief that there is better than here. When I weigh x amount of pounds. When I make x amount of money. When my house looks perfect. When I….THEN I’ll be happy. Things over there are better than they are here and if I were better. If I were a better human being then I could have that. This is especially when it comes to our appearance and body image. We’ve been taught by society that this is an area we have sole control over. What we eat, how much we exercise. We could and should all look like supermodels. If I were a better human being and had more self-control to say no to that cookie, then I’d look better. Then I’d be happier. We have this really skewed idea of body image and appearance in our society. Thinner is better, younger is better, prettier is better. So we’re constantly beating up on ourselves because if we don’t weigh under 100 pounds something is wrong with us. If I get a gray hair, I’m getting old and that’s not acceptable. 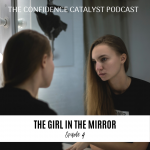 So we develop this inner self-critical track and we develop anxiety, panic attacks, eating disorders, sleep problems, and many other things because we’re never at peace where we are. In our own bodies, in our homes, with our family and friends, in our job, in our callings. There’s always this pressure and weight that where we’re at isn’t enough. We should be doing more, being better, looking better, aging slower. We’re racing to get to this mirage because once we get there then maybe, finally we can feel at peace. One byproduct of being a perfectionist and being hypercritical of yourself and all your perceived flaws is that your critical and judge-y of others as well. You’ve given your brain this focus to be on alert looking, searching, hunting for perfection so in your friendships, in your family, in your marriage you’re constantly focusing on what’s wrong. You compare yourself to others. You can’t just go and have a friendly let’s hang out date without you being critical of the other person and it’s not because you’re a bad, critical person. It’s because that’s what you’ve trained your brain to do. You’re on the lookout for perfection and oh, that’s not it. I wouldn’t have worn that. I wouldn’t have said that. That talk should have been more interesting. And the more you do this the more aware you are that others might be doing it to you too which only amplifies the pressure and worry that people will find out you’re not perfect and that’s not okay. This is true for others but most especially true for ourselves. When we stop expecting perfection from us all the time, we can start learning to like us the way we are. Too many of us are programed to hate on ourselves. To talk down to ourselves. To constantly be critical to ourselves. When youre in that state, it’s really hard to find anything good about you, to like you at all. So being open to the possibility that you don’t have to be perfect allows for you to embrace who you are and actually like and appreciate who you are and who you are striving to become. Our primitive, natural man brain it’s wired to keep you safe. Keep you alive. Keep you included in the tribe. On your own it meant death. You couldn’t survive without your tribe. You needed to be included. You needed to be accepted and your brain has this belief that perfect means being included. Perfect means being accepted. If you’re not perfect it could mean that you’ll be rejected and to your primitive wiring, that equals death. So it’s going to do whatever it can to protect you from that. Don’t share. Don’t be vulnerable. Pretend. Fake it. No one needs to know you’re a mess on the inside. But here’s the thing, you want to connect with people but people can’t relate to perfect. We connect through vulnerability. We connect through being human and being human is learning, growing, trying, failing. Perfectionism doesn’t allow space to learn because you should already know it. They’re the non-learners. They aren’t willing to raise their hand, to ask for help, to show signs of vulnerability because that’s weakness. But as a perfectionist you’ll never reach that point of knowing because you’ve patterned your brain to seek out flaws. It’s only going to look for what is imperfect, in you, in your appearance, in your relationships, in what you put out into the world. You keep hoping that when you finally reach that point you’ll feel better and this is because when you finally reach this fictional point that maybe then you’ll be perfect and you can finally start being nice to yourself. But you’ll never get there. There is an illusion. You thought the goal was to be 100 pounds but when you get there you’re like, nope. Still not happy. Maybe the goal is 90 pounds. But this is just it. You’ve programed and wired your brain to look for, seek out imperfections and flaws. It will never tell you you’ve arrived or that you’ve achieved it. It can’t. It’s not programed to do that. So you can’t trust your brain to tell you when you’ve finally arrived. You have to learn how to adopt a new perspective. You have to rewire your brain to hunt for and seek out something other than flaws and what’s wrong here. So how do you do that? How can you become a learner and be okay learning instead of a non-learner – perfectionist? First you have to allow a little wiggle room to be present. Curiosity is the best spacer from our current beliefs to what we want to believe. If I really want to be accepted but right now I feel unworthy and imperfect then I want to start by questioning why I’m not acceptable now. Question what perfect is. Question the idea that you’d know and recognize when something is perfect. Question the idea that you’d be able to know when you’ve reached perfection. It’s that idea that we think we know. After my last baby was born, like right after I wasn’t feeling the mom bod and I had this idea that if I could get back down to my pre-kid weight then that’d be perfect. So I worked really hard and starved and achieved that goal but it was so anti-climactic because it wasn’t perfect like I thought it’d be. There were still flaws. I wasn’t as thin as I’d hoped. My body was shaped completely different – go figure after four kids. But THERE, getting to that point of perceived perfection was a lie. I was so programmed to see what was still lacking that I couldn’t even enjoy all the hard work that’d I’d done because to me, it wasn’t enough. I still wasn’t enough. So you have to start questioning that you’ll know when you get there because you won’t. Your brain won’t ever believe that because it’s wired to seek out flaws. No matter how perfect things are, it will still find something to narrow in on and complain about. So start by questioning perfection. Start by questioning your credibility to judge when something is perfect or not. You can question your idea of perfection, which I think is a great idea too. This change in perception alters your entire world and allows you to enjoy and embrace who you are. Question why you need to be perfect in the first place. Why is that important to you? What will you make that mean about you when you finally get there. Questions give you a little bit of distance between you and your hyper-critically focused brain. It interrupts the cycle and pattern and in that space you can start planting a new idea. This is the good enough idea. Adopt a B- mentality. I know you’re probably cringing at this. I know I certainly did when I first learned it. I was more of a perfectionist than I realized and the idea of good enough was clearly not good enough. But when I applied both the rethinking what perfection is and adopted a B- mentality my world changed. In the book, The Practicing Mind by Thomas M. Sterner he says, “we may find peace in the observation of a flower. Ask yourself: At what point in a flower’s life, from seed to bloom, does it reach perfection? If you really think about it, the seed is perfect at being a seed even though it doesn’t have much to show for it. The sprout is perfect at being a sprout even though it doesn’t have a blossom yet. The budding flower is perfect at being a bud. We never yell at the flower and chastise it or are critical because it’s not a full on rose yet. We love the cycle of the flower. It reaches perfection at each stage it’s in. Likewise, can you accept that you are perfect at being you, right now? You are perfect at being a human. You are perfect at being where you’re at right now, at each stage you’re at – you can be perfect at being you. Now allow room for the good enough, B- mentality. Perfectionism often blocks us from progressing because we don’t want to put anything into the world that isn’t perfect. Think about how many photo’s you’ve deleted of yourself because you thought you weren’t perfect in them. “I’m not keep this one around! I don’t want to remember that!” All because you didn’t feel pretty enough, skinny enough, dressed well enough. What if you could go with the B- mentality there? I’m there, proof that I showed up, that I lived, and loved. Nothing is ever going to be perfect in our minds until we question what perfection is. Until we see that perfection is the whole picture – all of it, the lights, the darks, the contrast. Perfection includes everything. You are perfect at being human with the up’s and downs. With the contrasts of thoughts. With the the vulnerabilities. When you adopt the B- mentality you’re moving forward. You’re progressing. Carol Dweck talks a lot about this in her book that people are born with different gifts and are more easily talented in certain areas. This doesn’t mean that only they can dominate that field though because work – B- progression has been proven not only to catch up with natural talent but to surpass it. The perfectionist ones that are too afraid to be seen and heard practicing because they should already KNOW it don’t progress. They can only go as far as their natural talent affords. They’re the non-learners. But the learners, the B-er’s are willing to fail again and again and again because they’re not making those failures mean anything about them. They failed. It’s never I’m a failure. Perfectionists look towards future victories and how far they still have to go. Learners look at past and current victories and how far they’ve come. Perfectionists say, “When I….then I’ll – ex: When I make x amount of money then I’ll be successful. Learners say, “because I…I know I’ll” -“because I’ve come this far I know I’ll accomplish my goals. Perfectionists look for what’s going wrong. Learners look for what’s going right. Perfectionists don’t allow themselves to be human for fear of rejection. Learners know that being vulnerable and sharing their story is what contributes to connection. Accept that perfection, the idea that something is perfect is just a thought. It’s subjective. Try on the thought and idea that who you are and where you’re at right now, is perfect. You are perfect. You are perfect at being you. This doesn’t mean you don’t grow. Like the flower there’s stages, there’s so much more growth and life and humanity available to you, to see what you are capable of, to see what you want to create and contribute in the world. But you’ll miss all of this if you’re constantly berating yourself, if you’re not allowing yourself to be a learner. Let yourself be a B-er. Allow for progress over perfection. Allow yourself to believe that you are lovable and of value and of worth right now. You don’t have to hustle for your worth. You don’t have to prove that you’re valuable. You are inherently worthy, loved, and accepted. You don’t have chase those. You already are them. Practice believing that you are loved and loveable. Practice believing the becoming is better than already being. Let yourself be a learner. Let yourself be human. Let yourself be willing to be open and vulnerable with others so that you can experience more connection. You don’t have to be perfect right now. Let yourself be a learner. Try, fail, try again, fail again, learn and learn some more. Those failures are stepping stones on your path to becoming. Those failures do not mean that you are a failure. It just means that you’re willing to progress. You’re willing to embrace the struggle. You’re willing to grow. Okay, my friends. Let this one marinate for a while. If you need help with this and recognize some of these traits in yourself, reach out to me and maybe we can set up a consult call and get you some coaching. I would really love it if you could leave me a review on iTunes and help spread the word to all our friends out there. Have a great week everyone! My Backstory: What is a Catalyst?